This week, we had our first real storm of the season, or, in polie-talk, a blow. Storms here don't really include any sort of precipitation, and so are limited to just wind. This wasn't a "good blow", when the winds get up to 40-50 knots, but simply a blow, with winds peaking around half that. Enough snow was kicked up and tossed about to severely limit visibility, blot out most sun, moon and star light, and fairly quickly lead to a whiteout (though blackout would be a more accurate term). Earlier this week, some work was being done down in the power plant, necessitating a power conservation day. 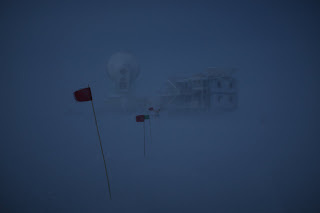 All non-critical computers, lights, heat and other equipment was turned off, and the station went into a sort of hibernation. Everyone was still working, but it was much quieter and darker than usual, and the whole day had a sleepy middle-of-the-night feel to it. When I got to Science (the lab space reserved for science people), the lights were out, it was pitch black, and in a corner someone was playing a harmonica. Certainly a new way to start my day. That same day, people started spotting the first stars in the sky. The sun officially set almost two weeks ago, but a distinct glow still migrates daily around the horizon. 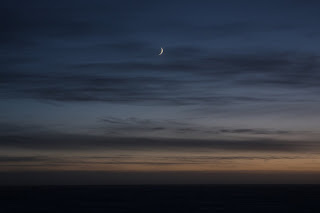 Every day it gets fainter, and every day we can make out more and more of the night sky. In another couple of weeks, the whole Milky Way should appear, and the auroras will begin. For the time being, though, there's still plenty of light outside, and on a clear day it's easy to forget that it's nighttime at pole. With sunset now well behind us, the station has begun battening down the hatches for winter. Because of the light-sensitive nature of some of the science projects going on down here, no stray light is permitted from buildings - all windows need to be blacked out by Monday. Only half of them are done, and out of the remaining half spills a warm and friendly glow. I'm going to miss that glow - it makes things here feel quite cozy. 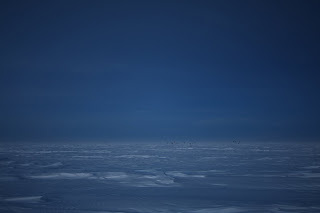 Behind DSL, the frozen ocean is more beautiful than ever, glowing an ethereal, almost electric blue. The commute to work continues to be a pleasure, now filled with serene, timeless scenery the entire way.